Published Mar 6, 2018 by Addison-Wesley Professional. Part of the LiveLessons series. An intuitive introduction to the latest developments in Deep Learning. 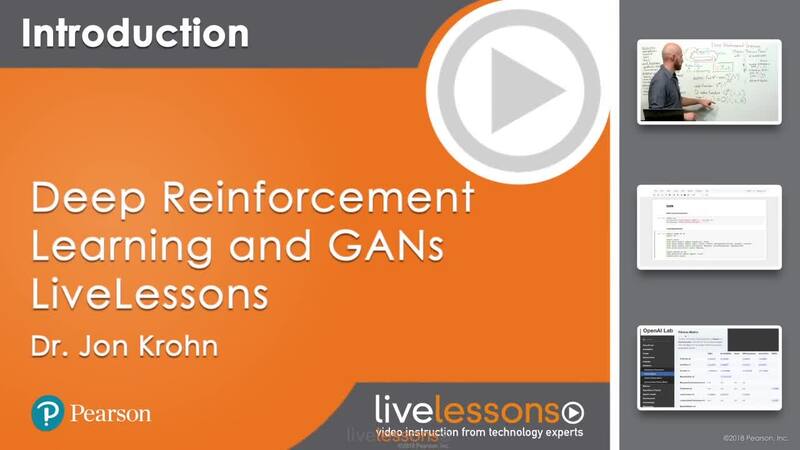 Deep Reinforcement Learning and GANs LiveLessons is an introduction to two of the most exciting topics in Deep Learning today. Generative Adversarial Networks cast two Deep Learning networks against each other in a “forger-detective” relationship, enabling the fabrication of stunning, photorealistic images with flexible, user-specifiable elements. Deep Reinforcement Learning has produced equally surprising advances, including the bulk of the most widely-publicized “artificial intelligence” breakthroughs. Deep RL involves training an “agent” to become adept in given “environments,” enabling algorithms to meet or surpass human-level performance on a diverse range of complex challenges, including Atari video games, the board game Go, and subtle hand-manipulation tasks. Throughout these lessons, essential theory is brought to life with intuitive explanations and interactive, hands-on Jupyter notebook demos. Examples feature Python and Keras, the high-level API for TensorFlow, the most popular Deep Learning library. Perfectly suited to software engineers, data scientists, analysts, and statisticians who want to further their understanding of deep learning. Code examples are provided in Python, so familiarity with it or another object-oriented programming language would be helpful. Previous experience with statistics or machine learning is not necessary. This lesson starts off by examining what the term “AI” means and how it relates to deep learning—particularly the advanced Deep Learning topics we’re covering in these LiveLessons. It continues by discussing cutting-edge applications of generative adversarial networks and deep reinforcement learning algorithms that have recently revolutionized the field of machine learning. We then quickly review how to run the code in these LiveLessons on your own machine as well as the foundational deep learning theory that is essential for building these advanced-topics specializations upon. Lesson 2 begins by covering the high-level theory of what GANs are and how they are able to generate realistic-looking images. Next is the “Quick, Draw!” game, which is used as the source of hundreds of thousands of hand-drawn images from a single class—such as apples, rhinoceroses, or rainbows—for a GAN to learn to imitate. The bulk of the lesson is spent developing the intricate code for the three primary components of a GAN: the discriminator network, the generator network, and the adversarial network that pits them against each other. Lesson 3 is the first of three lessons that explore deep reinforcement learning algorithms. It introduces a simple game called the Cartpole Game that is used throughout the rest of the lessons to train your deep reinforcement learning algorithms. Next, the lesson delves a bit into the essential theory of deep reinforcement learning as well as DQNs, a popular type of deep reinforcement learning agent. With that theory under your belt, you’ll be able to understand at an intuitive level the code that you subsequently develop when you define your own DQN Agent and have it interact with The Cartpole Game within a handy library called OpenAI Gym. In the previous lesson, a deep Q-learning network was used to master the Cartpole Game. This lesson builds upon those deep reinforcement learning foundations by using the OpenAI Lab both to visualize your DQN agent’s performance in real-time and to straightforwardly modify its hyperparameters. You learn how to automate the search through hyperparameters to optimize your agent’s performance and to gauge your agent’s overall fitness. The previous two lessons covered deep reinforcement learning largely through the lens of the deep Q-Learning network. In this lesson, your arsenal of deep reinforcement learning algorithms expands. The lesson begins with coverage of policy gradient algorithms, and then these are combined with Q-learning to discover the so-called actor-critic algorithms. The lesson closes out by covering why deep learning is reshaping software in general and by returning to the discussion of artificial intelligence—specifically addressing the limitations of contemporary deep learning approaches.